1. Preheat the oven to 180°C, gas mark 4. Grease and line the base of a 23cm x 33cm cake tin with baking parchment. 2. In a mixing bowl, cream together the Stork and sugar, then beat in the eggs, one at a time. Add half the lemon zest, then fold in the our and stir in the milk. Pour the mixture into the tin and smooth the surface, chasing the mixture right to the edges. Bake for 25 minutes, or until risen and springy to the touch. Cool in the tin for 5 minutes, before turning out onto a wire rack to cool completely. 3. Meanwhile, heat together the conserve or jelly, remaining lemon zest and juice and blackberries in a pan for 5 minutes, squashing the blackberries lightly into the melted jelly as they soften. Set aside to cool. 4. 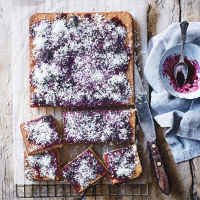 Spread the jelly mixture over the cooled cake, then sprinkle over the coconut. Cut into 15 squares before serving. TIP: This cake will keep for 3-4 days in an airtight container. It can also be frozen for up to a month – wrap tightly in baking paper and cling film.